If the “library of the future” is an environment in which knowledge is created, not merely preserved and accessed (as Arizona State University Librarian James O’Donnell suggested recently in his keynote at the 2015 Charleston Conference), then reference services are positioned within this future library to foster that environment (Hawkins, 2015). In reality, traditional reference services are often questioned as an effective model for delivery of research support in academic libraries. The reference desk as a physical space was called into question by Barbara J. Ford in the mid 1980’s and Sonntag and Palsson boldly stated in 2007 that “it is unquestionably time to eliminate the reference desk and recognize that the services it originally provided have been replaced by course-integrated instruction and research assistance ‘on demand’” (Sonntag and Palsson, 2007). Whether located at a central services desk or compartmentalized as a series of services such as roving or embedded reference, the way we think about reference delivery and the role it plays in the facilitation of intellectual experimentation and student scholarship is under constant pressure to demonstrate relevancy, and it certainly faces competition from both within and outside libraries (Campbell, 1992; Campbell, 2008; O’Gorman and Trott, 2009). Alternative “spaces” in libraries are not new, but they tend not be built around reference services. Beta spaces are defined by Jeff Goldenson and Nate Hill as “environments within a larger library ecosystem created to prototype and deploy new ventures” (Goldenson and Hill, 2013). While this often takes the form of makerspaces or digital labs in libraries, it also describes the work of student researchers (or any library user). Scholarship is a “new venture” and the reference space can be a safe place outside of the formal classroom where students can experiment, explore, and even fail without fear of negative consequences. In this article, I explore the concept of the beta space and think about the ways that reference as an activity is one that makes the most sense if delivered in a beta environment. The final section of this article is a narrative case study of my own attempt (which may or may not have been successful) to recontextualize reference services at my library into a collaborative, experimental environment designed to inspire, encourage user ownership of the space, and demonstrate the value of reference. The term “beta space” is not yet commonly used in library discourse, though the word “makerspace” is. Makerspaces have been around for over a decade, and according to MAKE Magazine, the term began being used widely in 2011 (Cavalcanti, 2013). According to the EDUCAUSE Learning Initiative (ELI), a makerspace is a “physical location where people gather to share resources and knowledge, work on projects, network, and build” (“7 Things You Should Know About Makerspaces”). Though this definition is broad, it emphasizes technology and the physical building of materials in a creative environment. Further along in its definition of makerspaces, ELI goes on to explain that “makerspaces owe a considerable debt to the hacker culture that inspired them, and many are still primarily places for technological experimentation, hardware development, and idea prototyping”. There are certainly elements of the makerspace in the beta space, but these terms (and these spaces) are not synonymous. The beta space is a prototyping space, but one that focuses more on ideas than technology. In a succinct definition from their article in Library Journal, Jeff Goldenson and Nate Hill describe beta spaces as “environments within a larger library ecosystem created to prototype and deploy new ventures.” Both Goldenson and Hill worked to co-develop two independent beta spaces at their respective institutions, The Harvard Graduate School of Design, and the Chattanooga Public Library. The emphasis for both of these projects was the development of a community that supported experimentation—not just with technology, but with ideas. (Goldenson and Hill, 2013). Chattanooga’s project is called “The 4th Floor.” It evolved from the transformation of a 14,000 square foot storage area into a collective learning environment. The space is described as a “public laboratory and educational facility” with a focus on information, design, technology and applied arts. The space features computers with access to interactive online courses, a small collection of business and innovation periodicals, provides access to digital technology, and serves as an events space. Harvard’s project was called the Labrary. Occupying a vacant storefront in Harvard Square, it was conceived by students as part of the Library Test Kitchen, a course taught at the Harvard Graduate School of Design. Unlike the 4th Floor, which is a permanent space, the Labrary was a 37 day experiment, essentially a “pop-up” library designed to facilitate creative collaboration, exhibit student work, and try out new ideas from the Library Test Kitchen such as tables that play low ambient noise to stave off complete silence (Koerber, 2013). Makerspaces, technology-rich labs, and the growth of digital humanities in the library space is not without controversy. The makerspace movement can be seen as part of a larger trend of applying a corporate mindset to library services, with a focus on technology and production rather than discourse. There are wider concerns that academic libraries are under pressure to adopt business strategies and focus on library users as “customers” (Nicholson, 2015) as well as on the creation of knowledge as a consumable product (Ward, 2012). A recent article in the Los Angeles Review of Books questions the neoliberal agenda of digital humanities in particular and specifically targets the “promotion of project-based learning and lab-based research over reading and writing” (Allington, Brouillette, and Golumbia, 2016). These concerns are legitimate and it is healthy to question the motivations behind the transformation of any library service. Library makerspaces—and by extension, beta spaces—are designed to support active learning through hands-on experiences. Kurti, Kurti and Fleming explain that “maker education is a branch of constructivist philosophy that views learning as a highly personal endeavor requiring the student, rather than the teacher, to initiate the learning process” (2014). I believe that beta spaces offer an opportunity to facilitate collaborative learning outside of the classroom in a way that does not negate the value of traditional scholarship, nor supplant traditional library services, but it does offer an opportunity to enhance them. Encourage community-driven innovation (Goldenson and Hill, 2013). It is important to remember the participatory element of beta spaces. The creative activities taking place within beta spaces such as the 4th Floor and the Labrary are user-driven. The spaces themselves were designed by librarians, faculty, (and in Harvard’s case, graduate students), but the work that goes on there is fueled by user inquiry, needs, and creative impulses. A participatory design approach to the development of beta spaces in libraries is therefore at the foundation of the concept. “Participatory design” was defined by the Council of Libraries and Information Resources (CLIR) in 2012 as “an approach to building spaces, services and tools where the people who will use those things participate centrally in coming up with concepts and then design the actual products” (Participatory Design in Academic Libraries). A beta space is nothing without the people who come into it to try out new ideas, whether through discussion, a more formal reference interview, the exhibition of user-created work, or even a creative response to a display prompt. The Idea Box at the Oak Park Public Library in Illinois is an example of a beta space-type environment that is set up by library staff, but then powered by the creativity of the public who interact with and add value to the space through participation. The Idea Box is a 19’ x 13’ glass-walled storefront with regularly rotating displays that encourage people to come in, “tinker,” and experiment. The range of activities in this space has included magnetic poetry, advice sharing, dancing, and oral histories—all driven by user contribution. Staff may have painted the room with magnetic paint and populated it with word fragments, but the poems were created by visitors and it is the visitors who give this space meaning (Library as Incubator Project, 2013). With these examples in mind, a beta space can perhaps be summed up as: a space within the library environment designed to facilitate knowledge creation in real-time through user participation and experimentation. This is also what I consider to be the heart of reference services. Reference as a library service can encompass a range of activities, depending on the type of library and its particular mission. I have attempted to identify a core definition of “reference services” from ALA’s Reference and User Services Association (Definitions of Reference – Reference & User Services Association), but found only definitions for the components of this service: “Reference transactions” and “reference work.” According to RUSA, reference transactions are “information consultations in which library staff recommend, interpret, evaluate, and/or use information resources to help others meet particular information needs.” The makeup of this reference work “includes reference transactions and other activities that involve the creation, management, and assessment of information or research resources, tools, and services” (RUSA). These definitions were last approved in 2008 by the RUSA Board of Directors and describe a fairly straightforward exchange between library staff and user, one that emphasizes the transference of information from authority figure to knowledge seeker and explicitly excludes formal instruction. With this definition, it is easy to see why reference services are at a cross-roads. “The Research and Information Services is the University Library’s central hub for research assistance, leading patrons to the discovery of library resources and expert help. We provide assistance to researchers working in all disciplines, help people to locate difficult to find items, and make referrals to subject specialists when appropriate. We support the educational mission of the university by approaching research support services from an instructional perspective, and by fostering user independence and the development of information literacy skills” (Mission Statement & Vision). While couched in the practical (i.e. locating items and making referrals), this mission statement addresses the centrality of reference services to the overall mission of the library, and encompasses instruction in a way that the RUSA definition does not. Likewise, New Jersey’s Newark Public Library philosophy of service puts reference at the very center of what the library does. Newark goes so far as to say: “Reference service at The Newark Public Library is one of the most vital and visible expressions of the Library’s purpose and mission and is key to each of the Library’s four primary service roles: to serve as a center for information, formal education, research and independent learning” (Reference Services Policy – The Newark Public Library). In many cases, however, reference services are not explicitly addressed in the library mission statements and the physical footprint of these services is being dismantled in some libraries. The news is often alarmist. In 2010, a Los Angeles Times article on libraries in the digital age opened with the declaration that a public library in the Denver area replaced its reference desk in order to make space for patrons to play “Guitar Hero” (Sarno, 2010). In his 2013 study, “Shall We Get Rid of the Reference Desk,” Dennis B. Miles found that a large percentage (66.4%) of academic libraries still use a physical desk to deliver reference services. But libraries are experimenting. In addition to desk-based services, librarians are engaged in roving reference, are consolidating service points (such as merging reference and circulation), and are offering more in-office consultations with students (Miles, 2013). 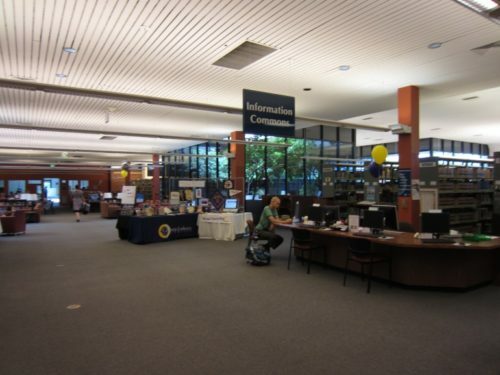 At Sonoma State University, the reference desk has gone through a number of transitions in recent years, starting with a roving reference program in 2012 and the consolidation of the Reference and Circulation Desks. While the combined desk allowed for more efficient staffing, it also served as a central place for answering quick directional questions and contacting subject specialists on an on-call basis (Lawson & Kinney, 2014). In 2001, librarians at Northwest Missouri State University completely removed their traditional reference desk and instead invested time in embedded instruction (both in the classroom and online), among other just-in-time services (Meldrem, Mardis, & Johnson, 2005). This model essentially disperses the research activities central to the work of the library across campus and within the online environment. Goldenson and Hill’s three themes for beta spaces (real-time knowledge creation, experimentation, and community-driven innovation) are very much in line with the scope of reference services. Because users are actively engaged in the research process while using reference services—or have the potential to be while asking more directional questions at the reference desk—the beta reference space is an ideal environment to make research visible through collaborative inquiry, curated reference source collections, and interactive and other displays/exhibits like those in the Idea Box at Oak Park. Placing reference within the beta space helps to clarify the services offered, inspire other researchers about what is possible, and educate users on available resources. Focusing on knowledge creation within reference services validates the work of the library user and helps to establish a healthy symbiotic relationship between library staff and user. When I was hired in July 2014 as the information specialist overseeing reference services at the Pearson Library at California Lutheran University, the lines between reference services, circulation, and information literacy were fluid and confusing. The official home base for reference services was the “Information Commons” (IC Desk), a dilapidated desk with two office chairs for staff on one side and a bank of 5 public computer workstations on the other. Open every day from 10am-10pm during the semester, the IC Desk was mainly staffed by students cross-trained in circulation. The Circulation Desk served as a de-facto reference desk during periods of understaffing. I needed to figure out what reference meant for us, how to ensure that it was meaningful to users and to the staff who worked there, and how to isolate it as a singular service in order to market it. In order to do this, I unconsciously drew on my experience teaching at an art school, where the students spent hours working in an atelier environment learning new techniques through trial and error. I was also greatly inspired by my very first library school class at San Jose State University in Spring 2015: “Innovation and Participatory Programming in Libraries,” taught by Monica Harris, to whom I owe a great deal of credit. This is where I learned about beta spaces. At the IC Desk, we were experiencing healthy patron interaction statistics. Based on internal statistics collected on Springshare’s LibAnswers Reference Analytics from Fall 2014, the IC Desk logged a monthly average of 101 in-person patron interactions and through LibChat, desk staff engaged in an average of 116 online chats with patrons per month (serving an FTE of approximately 4,100—about 2800 undergraduate and 1300 graduate students). Most of the time, the desk was staffed with students while librarians were on-call. The stats seemed good, but anecdotally, there was a lack of awareness about reference services at the IC Desk and low morale for those who worked at the “Isolation Corner.” Many users came to Circulation to ask reference questions and were annoyed at being redirected to the desk behind them. As the reference coordinator, it was challenging to staff the desk with librarians, who were heavily engaged with instruction and weren’t consistently able to commit to regular hours at the desk. For me, the Information Commons’ mission to “support research and learning by offering a conceptual, physical, and instructional space designated to deliver, instruct and gather information” was in question. It wasn’t really a commons. It was just a desk. With the support of the library director, I set out to establish a strategic plan for reference services (as a service and as a space) and as I developed these plans, they began to solidify around the concept of the beta space. The strategic plan’s stated mission was to “inspire research by providing a variety of research services to best meet the needs of CLU students, faculty and staff by creating a scholarly environment that supports student learning across departments.” The plan was founded on five primary goals, which were stated with no clear timeline, and were based on an outline developed by Nina Simon in The Participatory Museum in order to evaluate success. An important part of setting up a framework for later evaluation was not just thinking about the goals for the service, but about how users would ideally be affected by interacting with us. These desired outcomes are admittedly lofty. The plan was to transform the IC Desk into the “Collaborative Research Commons” and to think of reference services as operating not just from a desk, but as encompassing all of the space around it—including the glass atrium, mobile furniture, and exhibit furniture that was already near the desk. The desk itself was due for an upgrade so I proposed moving it to a slightly more central location (but in fact just a few feet away) and adding truly collaborative furniture around a mobile, U-shaped central desk. The Collaborative Research Commons would both replace and enhance existing IC Desk services. Instead of being parallel to the Circulation Desk near the entrance to the library, the new Collaborative Research Commons would be located adjacent to the library’s open-air central atrium, which could be leveraged as exhibition and workshop space. This is where I imagined that research would truly become visible. Students working in the space can be seen from all corners of the building and completed work can be hung on the glass. Aligning the new desk to this Idea Box-like space was central to the renovation proposal. The new area would feature a more open, approachable (and mobile) desk that faces approaching patrons coming in through the front doors. Optionally, a back-facing desk would face the general computer lab and serve as technology help, which did not have a public-facing desk in the library. Surrounding the service desk(s) would be four round tables (on casters) with seating for between four to six people each. These tables would serve small groups working together on projects, as well as space for longer research consultations with librarians. They would not have mounted computers (as in the existing IC Desk area), which impede mobility and effectively block communication between staff and patrons. 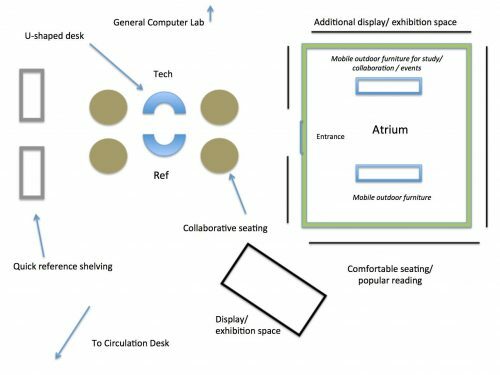 Laptops, tablets, and other technology could be brought into the space if needed from the existing mobile lab. These tables could also serve small classes coming in to do research together, which until then had relied on rows of desktop computers in the computer lab. By transforming the Information Commons into a “Collaborative Research Commons,” which emphasizes the activity as opposed to the resource, we would be employing a “beta space” approach to reference services that encourages exploration of ideas and a cooperative learning environment based on social interactions and participatory practice. Including collaborative tables and exhibition space into the overall research space is a way of “envision[ing]…boundaries in more porous ways” (Rogers and Seidl-Fox, 2011). The space would become a classroom-like space outside of the traditional classroom allowing librarians to meet with students and faculty for research appointments, not tucked away in back offices, but at one of the round tables with a laptop, for example. Now for the reality check. During the 2014-2015 academic year, we were not able to realize the physical transformation of the space through renovation, though library administration approved of the ideas and design consultants were brought in. The money just wasn’t available that year. But we ran a series of successful programs that demonstrated the potential of the beta reference space and generated new energy around reference services as the central arm for outreach and research support (as opposed to access services or information literacy instruction). 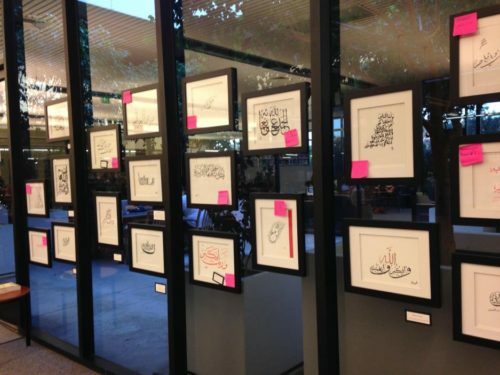 In our first event, the atrium windows were used for the first time as gallery space for a student exhibition of Islamic Calligraphy and a small reception was held adjacent to the IC Desk in December 2014. Students and faculty came to speak about their work learning a new language and artistic technique through experiential learning in this calligraphy course. 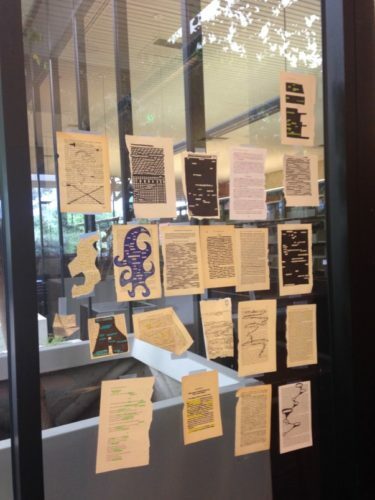 The following semester, the space was used to display erasure poetry made from weeded library materials by staff, faculty, and students. 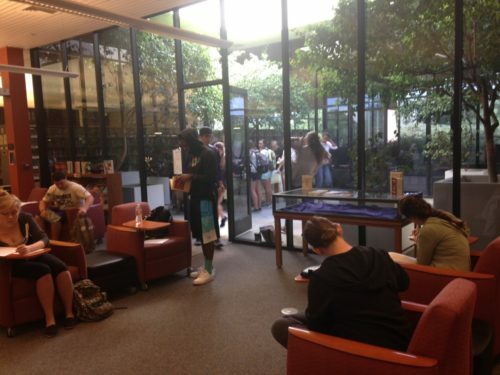 The atrium hosted two creative writing classes in which students added their final products to both the atrium’s windows and to the April National Poetry Month display, and were assisted by reference staff as they navigated the exhibit space and selected source material for their poems. 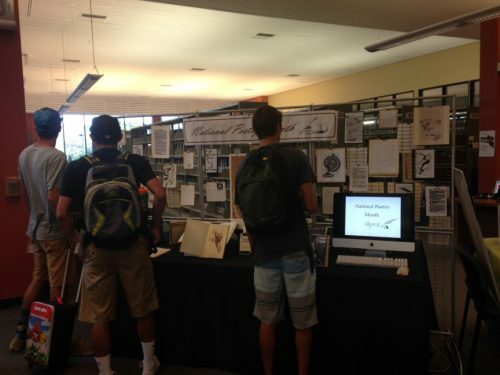 The IC Desk also served as a stop for a poetry prompt station (staffed by the same faculty member who brought her creative writing classes into the atrium) where library visitors also had an opportunity to add their work to the display. The events we held that year in the atrium and space around the IC Desk may or may not have happened regardless of the strategic plan for reference services. But we were intentional in making the (in this case) creative scholarship visible and placing these creative activities around ongoing reference activities at the services desk. Physical transformation of the space as proposed would help to cement the connection between the process of research and the resulting scholarship on display. Going forward, we would need to expand beyond art and poetry in order to truly align reference activities to the generation of new scholarly ideas and demonstrate the value of reference services by highlighting evidence of learning outcomes, student accomplishments, and models for inspiring research projects. The official Collaborative Research Proposal included dozens of thematic starting-off points to generate research ideas and pull in work from ongoing courses with amenable faculty members in a range of disciplines. Ideas included inviting campus wellness center staff to serve as “reference librarian for the day” during Health Awareness Month in January with interactive displays and resources on health topics; a “blind date with a book” display with a table set up for users to write Valentine’s Day love notes to their favorite books during February; and a mobile technology workshop with resources on creating short videos on tablets and iPads with an option to play the films on screens mounted in the space. Measure and compare length and type of patron interaction taking place at reference desk before and after implementation of beta space project changes using LibAnswers Reference Analytics tool; align interactions with ACRL Framework as is currently done with information literacy instruction. Include questions about awareness and effectiveness of environment and services in library survey deployed annually to students. Offer short point-of-service surveys (such as reply cards) at time of patron interaction and/or program or event. Measure attendance at programs and workshops. As programs are designed, define intended learning goals; document evidence of student learning through collection of work and/or photographs of participation and work (such as collecting found poetry and taking pictures of exhibition space after participants have added their work to it). Add a question about reference space to course evaluation for classes that utilized the space during the semester. Over time, collaborate with the alumni affairs department to identify post-graduation activities of participants and their continued perceptions of the library after graduation. Our work was decidedly beta. We tried something new and made some concrete proposals. Many libraries do the same kind of work and run the same kinds of programs that we did, but we placed these programs within the reference environment and linked the products of creative scholarship to the research process through physical association, and mindfully reconceptualizing the reference space as an informal learning environment founded upon experimentation. It is impossible to truly assess the success of what we did (beyond the communal feeling that we were on to something) because the Collaborative Research Commons proposal wasn’t actualized and the methods of assessment couldn’t be tested. I left the Pearson Library the following summer and I know creative work continues to be done there, but I can’t know for sure how much of the original proposal will be supported in my absence. “Some features of a learning-centered design – with the generous provision of group study spaces and information and learning commons chief among them – are now regular features of library planning. It is far from clear that our concern with learning goes much beyond these features, however” (Bennett, 2009). I believe that incorporating the ethos of the beta space into the library learning space, and placing reference services within this context, is a way to take this next step. In my dream of dreams, academic reference librarians and subject specialists would not have offices deep in the back of the library building only to emerge for a couple of hours at the reference desk, but they would be permanently based out in the open—visible models for research and intellectual engagement in a user-driven, participatory environment like a beta space. Understaffing is likely to continue to be a problem for many libraries long into the future, and the beta space model is an experimental step towards blurring the lines between faculty office, classroom, scholar commons, and gallery. Librarians would not have static “shifts” out at a desk, or recede into the depths of an interior office to hold consultations. In the beta space model, there are opportunities to place librarians more permanently in public spaces by placing their offices within the space. This has the potential to relieve some of the pressure on reference librarians forced to bounce back and forth between office, desk, and classroom. It also has the potential to infuse reference services with subject expertise from teaching faculty, graduate students, and visiting scholars. It could be a place where faculty or graduate “subject experts” could hold public office hours or drop-in research sessions, groups could engage in collaborative research projects, and technology experts could triage technology questions. These alternative activities keep the space alive even if there isn’t a reference librarian on duty at a given time. Again, these things aren’t necessarily new to reference services, and these activities may be happening in other parts of the library or across campus, but I see an opportunity to centralize these key learning activities around reference services. In terms of curating the products of knowledge creation, our work at Pearson Library captured primarily examples of creative work—poetry, art, etc. But other examples could include collections of bound theses and dissertations, screens highlighting student and faculty work collected in institutional repositories, physical collections of student or community newspapers, campus journals, zines, or thematic user-curated displays of library materials. White boards, chalk-board paint, over-sized sticky notes, and tables topped with white-board surfaces are just some of the ways to collect the ephemera of the research process within the reference space. In addition, these activities support focus on student creation of knowledge as part of information literacy education as described in the ACRL Framework and have the potential to be expanded into a larger information literacy program in collaboration with other library departments (“Framework for Information Literacy for Higher Education”). Showcasing the work of student and faculty researchers provides a model and a shining light of what is possible. It is both inspiring and encouraging. When this is done in the active, participatory environment of the beta reference space, research is highlighted as both an end-goal and a process. The heart and soul of reference services is the personal interaction between librarian and user, which is itself an entrypoint into intellectual discourse. As technology evolves, this interaction takes on many forms—it can be a telephone call, an online chat, an embedded classroom session, or a conversation while sitting in front of a computer workstation. Reference services is not bound by a desk, nor even by a room, but allowing the reference space to incorporate the elements of the beta space through display, participation, collaboration, and simple conversation, the “beta space” model positions reference services as essential to branding the library and facilitating an environment of intellectual curiosity and exploration. 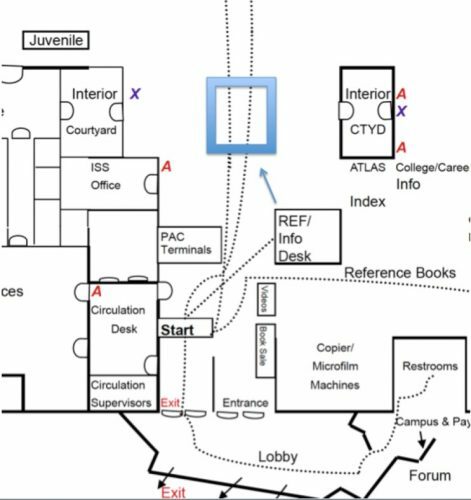 This might not work for every library—not everyone has a central atrium of course—but I truly believe in the value of reference services and in the value of the beta space. By merging the two, libraries offer a unique opportunity for user empowerment, demonstration of value, and research support. I would like to offer my most sincere thanks to Ian Beilin and Kate Adler for their incredibly meaningful feedback and guidance during the peer review process. As the internal reviewer for In the Library With the Lead Pipe, Ian offered supportive, substantive commentary on multiple drafts and some keen editing skills. Kate made connections I wouldn’t have thought of on my own as external reviewer, and I have greatly valued her insights. Many thanks to Erin Dorney, publishing editor at In the Library With the Lead Pipe, for her support and guidance. I would also like to sincerely thank Monica Harris for first introducing me to the beta space. Thank you! Bennett, S. (2009). “Libraries and Learning: A History of Paradigm Change.” portal: Libraries and the Academy. 9(2), 181-197. Campbell, J.D. (1992). “Shaking the Conceptual Foundations of Reference: A Perspective.” RSR: Reference Services Review, 20(4), 29-36. Campbell, J.D. (2008). “Still Shaking the Conceptual Foundations of Reference: A Perspective.” The Reference Librarian, 48 (100), 21-24. Ford, B. J. (1986). “Reference Beyond (and Without) the Reference Desk.” College And Research Libraries, 47(5), 491-94. Kurti, S., Kurti D., & Fleming L. “The Philosophy of Educational Makerspaces: Part 1 of Making an Educational Makerspace.” Teacher Librarian. 41(5), 8-11. Medlrem, J., Mardis, L., and Johnson C. (2005). “Redesign Your Reference Desk Get Rid of It!” In Currents and convergence: Navigating the rivers of change : proceedings of the Twelfth National Conference of the Association of College and Research Libraries, April 7-10, 2005, Minneapolis, Minneapolis, Minnesota. Chicago: Association of College and Research Libraries. Nicholson, K. P. (2015). “The Mcdonaldization of Academic Libraries and the Values of Transformational Change.” College & Research Libraries, 76(3), 328-338. Simon, N. (2010). The Participatory Museum. Santa Cruz, Calif.: Museum 2.0. Ward, S. C. (2012). Neoliberalism and the Global Restructuring of Knowledge and Education. New York: Routledge.